"He who fails to plan, plans to fail." All businesses, even ones made of gold, need a plan. Pretend to go back in time to the Gold Rush, and try making your own business plan and draw an advertisement for it. 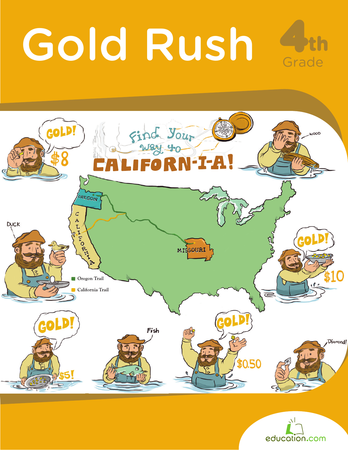 Learn about the different routes people could take for the California Gold Rush. The California Gold Rush sets the stage to practice reading and social studies skills. Convert prices of supplies from the California Gold Rush to today's monetary values. What you find in this fun history and math exercise may shock you! Sutter's Mill is where the California Gold Rush first began! Your student will read about the first discovery of gold with this history worksheet. Find out with this Gold Rush worksheet. The Gold Rush wasn't great for some, such as women, Chinese-Americans and Native Americans. Read about them and consider their dilemmas with this worksheet. Learn some historical myths about gold with this worksheet, touching on the California Gold Rush, King Midas and Jason and the Argonauts. During the Gold Rush, people weren't sure if they found gold or something else, and these easy steps would help them be sure. 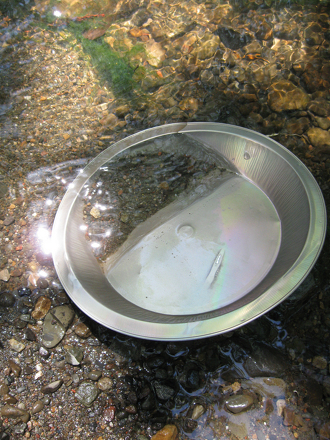 Learn what it was like to be a prospector during the California Gold Rush by panning for gold in a local creek. Give your kid a true taste of history by searching for gold the way they did back in the day! Follow these directions to learn how to pan for gold.